In an American election season that's turned into a bonfire of the orthodoxies, one taboo survives pretty much intact: Deficits are dangerous. A school of dissident economists wants to toss that one onto the flames, too. It's a propitious time to make the case, and not just in the US Whether it's negative interest rates, or helicopter money that delivers freshly minted cash direct to consumers, central banks are peering into their toolboxes to see what's left. Despite all their innovations, economic recovery remains below par across the industrial world. Calls for governments to take over the relief effort are growing louder. Plenty of economists have joined in, and so have top money managers. Bridgewater's Ray Dalio, head of the world's biggest hedge fund, and Janus Capital's Bill Gross say policy makers are cornered and will have to resort to bigger deficits. "There's an acknowledgment, even in the investor community, that monetary policy is kind of running out of ammo," said Thomas Costerg, economist at Standard Chartered Bank in New York. "The focus is now shifting to fiscal policy." That's where it should have been all along, according to Modern Money Theory. The 20-something-year-old doctrine, on the fringes of economic thought, is getting a hearing with an unconventional take on government spending in nations with their own currency. Such countries, the MMTers argue, face no risk of fiscal crisis. They may owe debts in, say, dollars or yen - but they're also the monopoly creators of dollars or yen, so can always meet their obligations. For the same reason, they don't need to finance spending by collecting taxes, or even selling bonds. The long-run implication of that approach has many economists worried. "I have no problem with deficit spending," said Aneta Markowska, chief US economist at Societe Generale in New York. "But this idea of the government printing money - unlimited amounts of money - and running unlimited, infinite deficits, that could become unhinged pretty quickly." To which MMT replies: No one's saying there are no limits. Real resources can be a constraint - how much labor is available to build that road? Taxes are an essential tool, to ensure demand for the currency and cool the economy if it overheats. But the MMTers argue there's plenty of room to spend without triggering inflation. The US did dramatically loosen the purse strings after the 2008 crisis, posting a deficit of more than 10 percent of gross domestic product the next year. That's since been trimmed to 2.6 per cent of GDP, or $US439 billion, last year. The Congressional Budget Office expects the gap to widen in the coming decade, as retiring baby-boomers saddle the government with higher social security and health-care costs. That's the risk often cited by fiscal hawks. Mainstream doves accept the long-term caveat. But they point to record-low bond yields and say investors aren't worried about deficits right now, so why not spend? MMT takes that argument even further. The question is: Who's listening? "They're shut out of the central banks, the finance ministries, the Treasuries of the world," said Joe Gagnon, a senior fellow at the Peterson Institute for International Economics in Washington and former Federal Reserve Board economist. Gagnon doesn't subscribe to all MMT arguments, but thinks there's enough slack in the global economy that "it'd be a good time for them to have influence". If MMT seems marginal now, Randy Wray, an economics professor at the University of Missouri-Kansas City and one of the doctrine's founders, recalls a time when it barely registered at all. Wray, who wrote "Understanding Modern Money" in 1998, says he used to meet with like-minded colleagues and count how many people understood the theory. "After 10 years, we had to go a little beyond two hands - we had to use a few toes," he said. Now, thanks to the blogosphere, he says there are thousands around the world, especially in struggling euro-area countries like Italy and Spain. MMT was among the early doomsayers on the single currency, arguing the lack of monetary sovereignty would render governments helpless in a crisis. In the US, one presidential candidate is at least listening to MMT economists. Advisers to Bernie Sanders include some of the school's leading advocates: Stephanie Kelton, a Sanders hire to the Senate Budget Committee, and James K. Galbraith, whose father helped shape President Lyndon Johnson's "Great Society" programs. The match makes sense. Sanders is promising massive investments in health, education and infrastructure. Economists who see more danger in fiscal austerity than looseness make natural allies. Ask the campaign, though, and they're quick to point out that the Vermont senator is a "deficit hawk" whose spending plans are matched dollar-for-dollar by tax increases. 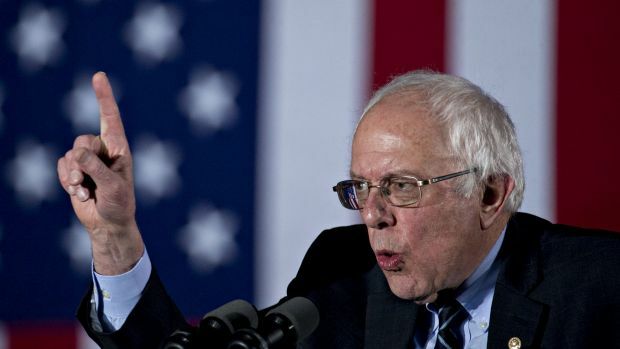 "He's not interested in theory," said Warren Gunnels, Sanders' policy director. "He's interested in making sure that we rebuild the middle class, increase wages and make sure that we no longer have one of the highest poverty rates of any developed country." So even a left-leaning candidate with MMT economists on staff shies away from endorsing the doctrine - an indicator of what a hard sell it is. Those who push back sometimes argue that money-printing puts countries on a path that eventually leads, in a worst-case scenario, to Zimbabwe - where money-printing debased the currency so badly that all the zeros could barely fit on banknotes. Or Venezuela, whose spending spree helped push inflation to 180 percent last year. Japan's a more mixed picture: years of deficits haven't scared off borrowers or unleashed inflation, but haven't produced much growth, either. There's also a peculiarly American enthusiasm for balanced budgets, according to Jim Savage, a political science professor at the University of Virginia. He's traced it to the earliest days of the US, rooted in a "longstanding fear of centralised political power, going back to England." Wray says there are episodes in American history when a different understanding prevailed. During World War II, he says, US authorities learned a lesson that's since been forgotten -- that "we've always got unemployed resources, including labor, and so we can put them to work." Savage says Americans have historically tended to conflate household and government debts. That category error is alive and well. "Small businesses and families are tightening their belts," President Barack Obama said in 2010 as he announced a pay freeze for government workers. "Their government should, too." It's not just MMT economists who winced at the comment. Many more agree that it's precisely when households are cutting back that governments should do the opposite, to prevent a slump in demand. That argument doesn't carry much sway in Congress, though. That's one reason the Fed has had to shoulder so much of the burden of keeping the recovery alive, Societe Generale's Markowska says. "When it comes to deciding on monetary easing, it's a handful of people in the room," she said. "It's going to take more pain to build that political consensus around the fiscal stimulus." Wray says he'd expected attitudes to start shifting after the last downturn, just as the Great Depression gave rise to Keynesian economics and the New Deal, but "it really didn't change anything, as far as the policy makers go." "I think it did change things as far as the population goes," he said, citing the anti-establishment campaigns of Sanders and Republican Donald Trump. It might take another crash to change minds, Wray says. Most economists don't expect an imminent US recession. But financial-market turmoil and America's political upheaval have added to a sense that nobody has figured out a cure for the economy's malaise. Bill Hoagland, a Republican who's vice president of the Bipartisan Policy Center, has helped shape US fiscal policy over four decades at the Congressional Budget Office and Senate Budget Committee. He says a farm upbringing in Indiana helped him understand why "it's engrained in a number of Americans outside the Beltway that you equate your expenditures with your revenue." He also acknowledges that government deficits are different, and could be larger now to support demand, so long as there's balance in the longer term. Most of all, Hoagland says he sees profound change under way. The "catastrophic event" of the 2008 crash may be reshaping American politics in a way that's only happened a handful of times before. And economic orthodoxy has taken a hit too. "We're going through a very strange period where all economic theories are being tested," he said.